Early March brought the ‘Beast from the East’ blasting the spring flowers into abject submission and turning the garden to stone. With the Hurstpierpoint Horticultural Spring Show less than a fortnight away all looked very bleak indeed. But, as the thaw began, the Committee sent out a plea to all members of the Society to do their very, very best to enter something into the Show. And we hoped for the best. Show day arrived and, would you believe it?! The Beast was back. Snow swirled around the village and a bitter east wind cut across the car park. But gardening types are a hardy lot. They arrived at the Village Hall muffled in big coats, scarves and gloves carefully protecting their precious daffodils, camellias, hellebores, orchids and, yes, even a few pulmonarias and primroses. And then there were cakes, sausage rolls, pots of marmalade and chutney, floral art and photographs and the Hurstpierpoint Preschool artwork. Yes, we had a Show! There was close competition in all sections of the Show. 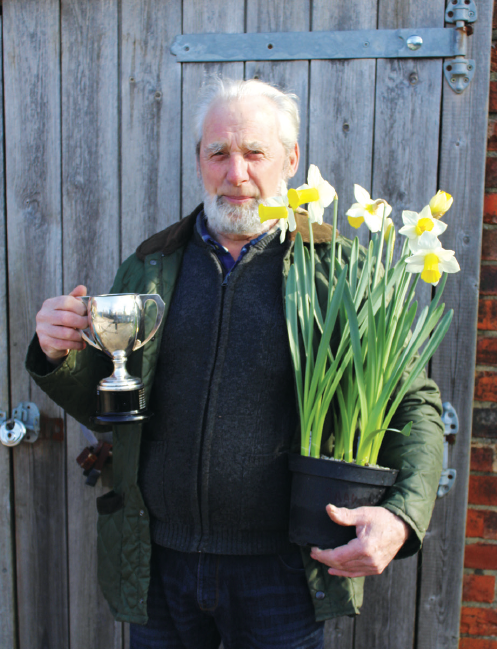 Stan Cartwright beat Pat Kean by just one point to win the Stapleton Cup for Daffodils/Narcissi. The Spring Cup for the best camellia was won by Alison Chivers and the Junior Spring Cup was won by Aimee Murtagh who made a beautiful vase of paper flowers. The other Section winners were June Kentsley for Floral Art, Pat Kean for Cookery, Kathy Green for Photography, Denis Hills for the novice daffodil section and a tie for Other Flowers between Jill Mance and Denis Hills. Many congratulations to all the prize winners. But, on the day, everybody who contributed to the success of the Show was a winner. We collectively confronted the ‘Beast from the East’ and we won.